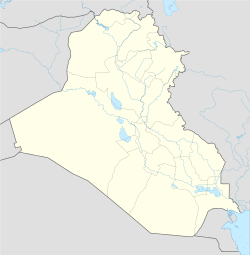 Kirkuk (Arabic: كركوك‎ Karkūk; Kurdish: که‌رکووک Kerkûk, Turkis: Kerkük; Clessical Syriac: ܟܪܟ ܣܠܘܟ ,ܟܪܟܘܟ‎ Karkh-Selokh) is an Iraqi ceety in northren Iraq, 236 kilometres (147 mi) north o Baghdad an 83 kilometres (52 miles) sooth o Erbil. It is the caipital o Kirkuk Govrenorate. ↑ "World Gazetteer". World Gazetteer. 26 January 2009. Archived frae the oreeginal on 9 February 2013. Retrieved 2009-01-26. ↑ "Google Maps Distance Calculator". Daftlogic.com. 12 January 2013. Retrieved 2013-03-26. This page wis last eeditit on 24 Apryle 2017, at 17:14.